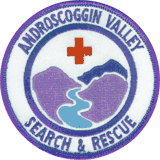 Androscoggin Valley Search and Rescue (AVSAR) was founded in 1993. It is a charitable and educational association which was established "to save lives and lessen suffering". Its mission is to assist New Hampshire Fish and Game Department, U.S. Forest Service, and other rescue agencies in carrying out backcountry search and rescue operations in the White Mountain region and in promoting safety in dispersed outdoor recreational activities. AVSAR is a private, non-profit, 501-c-3 organization. While centered in the Gorham-Randolph area, its members reside in all corners of the White Mountain region, and respond to authorities' requests for assistance throughout the area. The approximately 50 members of AVSAR have "day jobs" which include State Park and Forest rangers, educators, contractors, accountants, IT personnel, small business owners, and more. Their outdoor experience varies, ranging from three-season hiking in the White Mountains to technical climbs on peaks in Alaska, Europe, and South America. AVSAR members have medical training ranging from basic first aid to EMT and MD. They all share a passion for the outdoors, and an interest in "giving back" by helping others to the best of their abilities. If you're interested in supporting AVSAR please visit our "Donate" page to make a tax-deductible donation. We except all major credit cards and checks. We appreciate all that you can do to help us in our mission to help save lives and lessen suffering. If you’re interested in becoming part of the AVSAR Team please email a letter of interest and a brief description of your certifications and background.